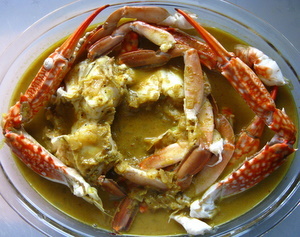 There is nothing more satisfying than a hot and spicy crab curry served with boiled rice. All right, maybe I am exaggerating but you have to agree that curried crab is way to delicious. Please use your discretion to the number of chilies you use in this recipe. You can remove the seeds from the red chilies to reduce the hotness. * Fresh coriander leaves to garnish. Clean and chop the crabs into bite size pieces. Thinly slice 2 onions and finely chop the other 2. Deep fry the thinly sliced onions until golden brown. Drain on kitchen paper. Heat 2 Tbsp oil in a pan and add the cloves, cardamoms, cinnamon, coriander seeds, cumin, chilies and pepper corns. Saute a little and remove aside. Grind this, the fried onions and fresh coconut into a coarse paste using a little water. Top up some oil (maybe a tablespoon) in the same pan in which the spices were roasted and heat it. Add the chopped onions. Saute till soft and add the turmeric powder, saute for 30 seconds. Now add the coconut paste. Saute for 5 minutes. Till you see oil oozing out from the sides of the masala. Now add salt, curry leaves and tamarind paste. Also add a cup of water and bring it to a boil. Now slip in the crab pieces and cook on high for 5 minutes. Finally add the coconut milk and bring it to a boil. Simmer for 5 more minutes. That's it your crab curry is done. Sneak a taste and adjust the seasoning. Garnish with coriander and serve with boiled rice.